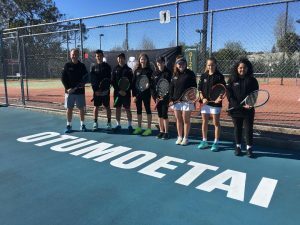 Welcome to the u2019 season of tennis at Otumoetai Tennis Club. If you are new to tennis and looking for a club to join, come down to one of our Friday club night (pizza night) or Saturday Morning Club Coaching sessions to join in and if you enjoy it (we know you will) you can become a member. Click the “Membership Info” link below to find out about membership. Our annual tennis season begins October 1 and ends September 30. Our ‘Junior Club Play’ Coaching, matchplay and organised activities are included as part of a junior membership. RACE TO 7 junior singles ladder challenge. Every Wednesday from 5pm to 7pm. FREE to enter For Green and Hard Ball members only. Challenge people every week and move up the ladder. First to 7 games format with long deuce. Contact Paul Bell to enter by April 29th. This is conducted during Term 4 and Term 1. NEW FOR TERM 2 2019. Term 2. Hotshots Club Coaching begins on Saturday May 11th 2019. Term 2. Saturday junior club morning. Bronze and Silver (Hard Ball): 11:15am to 12pm. Based on ability. If you are unsure which session to attend, contact club coach Paul Bell. Friday Afternoon Junior Club Pizza Night. This is conducted all year round during term time. A social tennis session to end the week. Bar open for parents from 3.30pm to 5.30pm. Term 2: Starts on Friday May 3rd 2019. Thanks to our sponsors Thrifty Car Rental, we are pleased to announce that we will be holding our annual junior tennis tournament on February 1st and 2nd 2020. This is the link to information on our tournament. 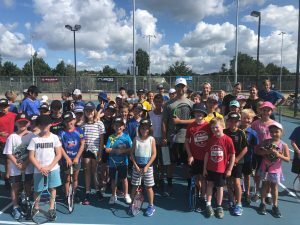 Our tournament on the Tennis NZ website. To see the DRAWS, TEAM LISTS and RESULTS, CLICK HERE! 2019 Pre-Xmas Junior Interclub is scheduled to begin in Term 4 from October to December 2019. 2020 Term 1 Post-Xmas Junior Interclub is scheduled to begin in term1 February 2020. Players must be a financial member of the club to participate. Interclub requires a committment of 4-8 weeks on Saturday mornings during Term 4 and Term 1. Matches are played at the various WBOP tennis clubs and each team has an adult team manager, who is typically a parent of one of the team members. To see our club champs results, CLICK HERE! To see our 2018 / 2019 prize Giving Awardees, CLICK HERE! PAUL BELL Tennis. Term time group coaching and Holiday Programmes. Contact Club Coach Paul Bell for more information.